It is known that use of hormone replacement therapy (HRT) by postmenopausal women increases the risk of breast cancer. In this study, oestrogen receptor (ER)-α expression is examined using standard immunoperoxidase technique. Normal breast samples of 11 Australian postmenopausal women have been included in the ER-α study; the result showed a strong correlation (r2 = 0.80) between ER-α expression in normal breast epithelial cells and body mass index (BMI) in normal women who currently use HRT. This finding confirms that the possibility of increased risk of breast cancer associated with increased ER-α expression in normal breast epithelial cells, in turn associated with high BMI and the use of HRT. Use of HRT by postmenopausal women is associated with an increased risk for breast cancer by a factor of 1.02 for each year of use (10% develop breast cancer after 5 years of HRT use) . The expression of ER-α appears to increase in the normal breast tissue of postmenopausal women who use HRT . High BMI (BMI = weight in kilograms/ [height in metres]2) is also associated with elevated risk for postmenopausal breast cancer . Accordingly, it is of interest to determine whether there is any association between BMI and ER-α expression in normal breast epithelial cells in normal premenopausal and postmenopausal women, who do not have breast or other cancers and who are current users and nonusers of HRT. Samples of breast tissue were collected from the archives of the Department of Anatomical Pathology at St Vincent's Hospital in Sydney, Australia. The samples had been obtained by open surgical and core biopsy from 32 premenopausal and 21 postmenopausal Caucasian Australian women, who had had biopsies taken in order to exclude breast cancer and for whom data regarding age, menopausal status, use of HRT, height and weight were available. The participants were recruited serially by going backwards in time from the most recent date of collection. The number of participants was dependent on the availability of specimens and relevant data. Only two out of the 32 premenopausal women were currently using hormone contraceptives. These premenopausal women were analyzed as a single group. Eleven out of the twenty-one postmenopausal women were currently using HRT. These latter women were analyzed in two groups according to current use of HRT. All biopsies had yielded benign, nonproliferative breast tissue. None of the women had breast or other cancers. Only normal breast epithelium regions, specifically the lobular unit, were considered for the present study. The breast tissue samples were fixed at room temperature in buffered 10% formalin and were paraffin embedded in one laboratory. The subsequent processing and staining of the samples was undertaken by one investigator (DDT). ER immunohistochemistry assays using anti-ER-α antibody Dako 1D5 and counts of breast epithelial cells were conducted as previously reported . Pearson's correlation coefficient is indicated by 'r2'. A correlation coefficient in the range 0–1 indicates a positive correlation, with 1 representing the strongest correlation; a negative correlation is indicated by a negative value. The results are shown in Fig. 1 and Table 1. There was a positive correlation (r2 = 0.80; P = 0.003) between BMI and ER-α expression among postmenopausal women who were currently using HRT. There was no correlation between BMI and ER-α expression in postmenopausal women who were not currently using HRT (r2 = -0.33; not significant). There were no correlations between BMI and ER-α expression in premenopausal women (r2 = -0.17; not significant). The average percentage of breast epithelial cells that showed positive ER-α expression was significantly higher in both postmenopausal HRT users and nonusers, as compared with premenopausal women (P = 0.001). 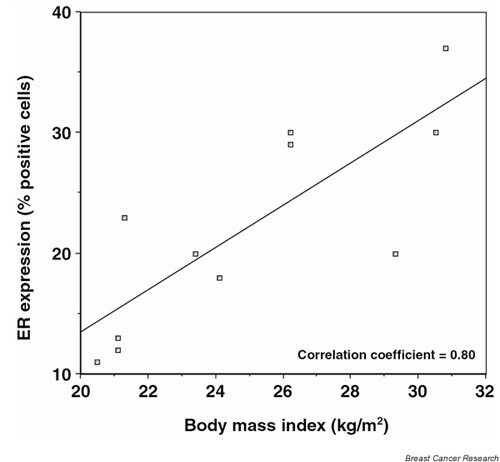 ER expression in normal breast epithelial cells and BMI of Australian women using HRT. Percentage of ER-α-positive normal breast epithelial cells in Australian pre- and postmenopausal women, correlated with height, BMI and use of HRT. A BMI of 25 or over suggests excess weight. NS, not significant at 95% confidence; P, two-tailed t-test at 95% confidence. The number of participants included in the present study is clearly small, and therefore the findings should be considered with caution. The correlation between ERα expression and BMI in postmenopausal women currently using HRT, however, is striking and is highly statistically significant. We showed in normal breast epithelial cells of normal women without breast cancer that there is higher ER-α expression in postmenopausal women than in premenopausal women, whether or not they are users of HRT; that the average levels of ER-α expression in postmenopausal women are similar, whether or not they are users of HRT; and that there is a marked increase in levels of ER-α expression in users of HRT who are overweight. The apparent contradiction of the second and third findings is due to the clustering of ER-α expression levels around the mean among nonusers of HRT, in contrast to the marked increase in ER-α levels of expression with increased BMI among users of HRT. It is probable that there is a reciprocal relationship between ER-α expression and levels of serum oestrogens, with high ER-α expression occurring in the presence of low levels of serum oestrogens, and vice versa [5,6,7,8]. ER-α expression in breast epithelial cells and serum oestrogen levels, however, are likely to have a more complex relationship than a simple reciprocal one. For example, use as compared with nonuse of exogenous estrogens (ie HRT) by postmenopausal women leads to a threefold increase in serum oestradiol and to a sixfold increase in serum oestrones . Accordingly, in the presence of such high serum oestrogen levels in users of HRT, it would be expected that there would be low ER-α expression. As shown in this and other studies , however, use of HRT by postmenopausal women does not result in the expected reduction in ER-α expression. Obesity or alterations in weight further complicate the underlying physiology in both premenopausal and postmenopausal women. Obesity in premenopausal women appears to reduce serum oestradiol. This is possibly because of reduced ovulation. Such obesity is associated with a reduction in risk for breast cancer risk [3,10]. Obesity in postmenopausal women leads to increased oestrogen formation from adipose tissues, and is associated with an increased risk for breast cancer . Among women who use HRT, however, the influence of obesity on serum oestrogens is small compared with that of exogenous oestrogens. In addition and of great importance to our understanding of breast cancer is that the presence of carcinogenic processes can both subtlety and dramatically alter any relationship between the expression of oestrogen receptors and serum oestrogen levels. In the majority of women who develop breast cancer, the proportion of breast epithelial cells that show positive ER-α expression increases in parallel with progression of carcinogenesis, from hyperplasia of epithelial cells, to localized cancer and finally to invasive cancer . This shows that malignant breast epithelial cells develop largely independent of overall physiology. It is possible that an increase in ER-α expression in normal breast epithelial cells may be associated with increased breast cancer risk. There are two lines of evidence that support this. The first is the observation by Kahn et al  that there is high ER-α expression in normal breast epithelial cells in women with breast cancer. These observed differences in receptor status may be influenced by the breast cancer itself, however, such as intramural production of oestrogen or growth factors. The second is the observation that ER-α expression in normal breast epithelial cells in normal Australian women is fivefold higher than in their Japanese counterparts . This high level of ER-α expression parallels the threefold higher risk of breast cancer in Australian as compared with Japanese women. This latter observation confirms similar findings for markedly differing levels of ER-α expression in normal endometrial epithelial cells from normal Finnish and Japanese women, which also parallels the differences in risk for endometrial cancer . Therefore, there is no satisfactory explanation for the findings of the present study. Consideration of the underlying mechanisms of steroid receptor activation and inactivation, and any hypotheses must be speculative . We speculate that, in an environment of HRT-induced presence of high levels of oestrogens, exacerbated by additional oestrogens sourced from adipose tissue in obese women, ERs may become overstressed and cease to function normally. Another possible explanation is the development of a hypersensitive ER-α mutation . Regardless of the mechanisms involved in the apparently abnormal ER function observed in the present study, the possibility exists of increased risk for breast cancer associated with increased ER-α expression in normal breast epithelial cells, in turn associated with high BMI and use of HRT. Thanks to the Medical Benefits Fund of Australia for financial support and to Dr Vincent Munro of the St Vincents Hospital, Sydney.